Composed of twenty-four woodcuts by renowned Japanese artist Tsukioka Yoshitoshi from the museum’s permanent collection, this exhibition presents the artist’s most representative and well-known series: New Forms of Thirty-Six Ghosts, One Hundred Aspects of the Moon, A Mirror of Strange Tales from China and Japan and Twenty-Eight Famous Murders with Verse. 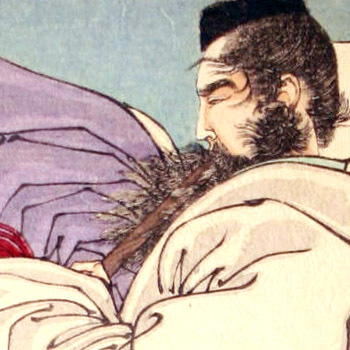 Tsukioka Yoshitoshi (Japanese, 1839-1892) is widely recognized as the last master of Ukiyo-e, a genre of woodblock prints and paintings that flourished in Japan from the 17th through 19th centuries. When he was a teen, he was apprenticed to Utagawa Kuniyoshi (1797-1861), one of the great masters of Japanese Edo-period woodblock prints. Yoshitoshi lived most of his adult life in the early years of the Meiji period (1868-1912), a time when Japan “opened up to the West” and began to embrace western culture’s modernity and mass production. Witnessing the new cultural influx, Yoshitoshi realized the loss of Japanese values and almost singlehandedly strove to preserve traditional art forms as evidenced in his artwork. The exhibition highlights traditional East Asian folklore as well as the artist’s superb skill and imagination. All of the polychrome woodblock prints on view are based on Chinese and Japanese folktales and history, and Kabuki, a stylized classical dance dramatization. Known for his creativity in depicting these subjects, Yoshitoshi presented the pinnacle moment of action in his prints. Ukiyo-e prints were usually a collaboration between the artist, several skilled block carvers, printers, and publishers to complete the work. Not only do these prints feature Yoshitoshi's name and the title but frequently acknowledge skilled individuals that helped develop the finished print. 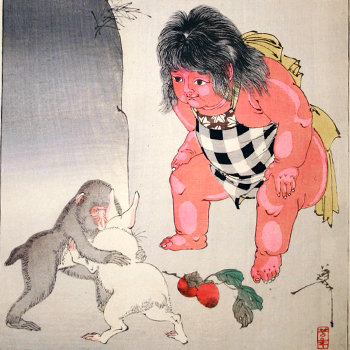 Tsukioka Yoshitoshi died in 1892 from mental illness, at age 53. 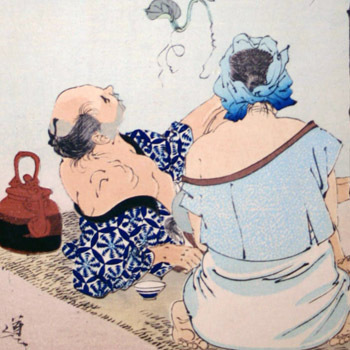 Due to his passion, innovation, and imagination within the Ukiyo-e style, he is often regarded as the greatest Japanese artist of his time and interest in his work has resurged since the 1970s. This exhibition is a first-time feature at the Taubman Museum of Art of works by Tsukioka Yoshitoshi and also emphasizes the museum’s renowned holdings of Japanese prints. 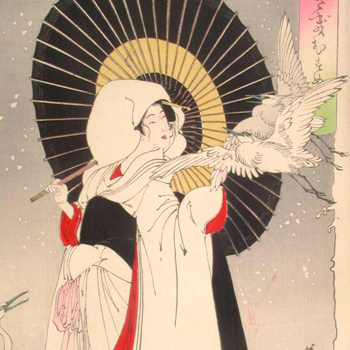 Though several donors have contributed Japanese prints to our permanent collection, which includes works done throughout the 19th century into the mid-20th century, two major contributors stand out. First is Roanoke native Peggy Macdowell Thomas, who gave over 200 works collected by her forebears Elizabeth Macdowell Kenton, Susan Macdowell Eakins, and her husband Thomas Eakins. More recently former Virginia Tech professor Arthur Squires gave a select group of over 50 Japanese prints, including many by Tsukioka Yoshitoshi and Utagawa Hiroshige. Tsukioka Yoshitoshi: Japanese Prints from the Permanent Collection has been organized by the Taubman Museum of Art and curated by Amy G. Moorefield, Deputy Director of Exhibitions and Collections with special assistance from Mary LaGue, Registrar and Tianchu Wu, Curatorial Intern. Sponsored in part by the Virginia Commission for the Arts and the National Endowment for the Arts, this exhibition will be on display in the Bank of America Foundation/ Dominion Resources Gallery.